Beautiful, rich, green Emeralds are prized as much for their luminous color as their rarity. Emeralds are great heart healers and soothers and are connected to Venus, Mother Earth’s loving sister planet. Associated with the Universal Green Ray of Abundance, Healing and Prosperity, Emeralds convey to the holder a great sense of well-being and peace. Worn by priests and royalty in Earth’s recorded history, Emeralds speak to us of purity and loyalty, and they hold a very high vibration. Cleopatra’s mines near the Red Sea produced the earliest known emeralds, although the highest quality is not found there. Their premier source today is the Muzo Mine in Colombia, South America, but they may also be found in India, the Russian Ural Mountains, Austria, Africa, Australia, Norway and some parts of the United States. 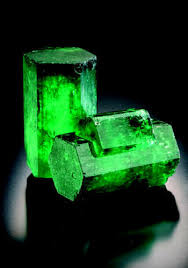 The Conquistadors from Spain coveted the Emeralds worn by the Aztecs and discovered the mines at Somondoco, Colombia, meaning “god of the Green stones” (now known as Chivor). Emeralds are part of the beryl family of minerals that has variations of color: clear (goshenite), blue (aquamarine) yellow (heliodor), pink (morganite), violet, blue and pale green. Chromium gives the Emerald is lush green coloration. They cleanse negative energies and emotional upsets of the heart. Like the Green Ray they emanate, they also stimulate inner growth and memory. They are a great tool to meditate with and to find inner sanctuary from the outward pressures of life. And, of course, they are magnificent to wear albeit costly to own in faceted form. Nonetheless, they are a wonderful crystalline friend for lightworkers. Emeralds have long been admired and treasured around the world, by the pharaohic Egyptians, and by the Mayan and Inkan peoples. While mined in India, Brazil, South Africa and Russia, Colombian specimens are also held in very high regard, partly due to their color and greater availability. Despite variations in hue, Emeralds resonate with the Emerald Ray, with Mother Earth and her energetic body, and with planet Venus. Their harmonious energies and crystalline essence are highly beneficial to All Things. Most notably for humanity, Emeralds vibrate to assist with the opening of the heart chakra to Unconditional Love and to the abundance of our planet. Emeralds are the stone for the broken-hearted and a great asset to those who choose to be courageous and step forward according to the energies of their hearts, Emeralds are arguably one of the most important gems on the planet and when combined with diamonds they are a stellar combination. Found deep within the Earth, and often beneath sacred sites, they help maintain the auric field of the planet, connecting to the Christ Consciousness grids. For the open-hearted, they can assist one to walk in life with authenticity aligning to the higher guidance received through the heart. It is not surprising, therefore, that this gemstone is associated with resurrection and alignment with one’s Higher Self. Allowing one’s heart to open will assist abundance and prosperity to flow. A marvelous meditation is to see the very Emerald that rests within your own heart chakra, feel its vibration and know that you are a conduit for both Heaven and Earth. Call upon Master Hilarion, Lord Sananda, Sanat Kumara and Lady Venus, Master Kuthumi and Merlin, to explore these energies within. To assist your process, you may place a raw emerald over your heart. As you open more and more to Divine Love, you may find that you will attract your ultimate partner, your Divine Complement, in form or in Spirit, with this enlivening precious gemstone and the essence of the Emerald Ray.